We have opportunities for new distributors. If interested please email info@quark-elec.com. 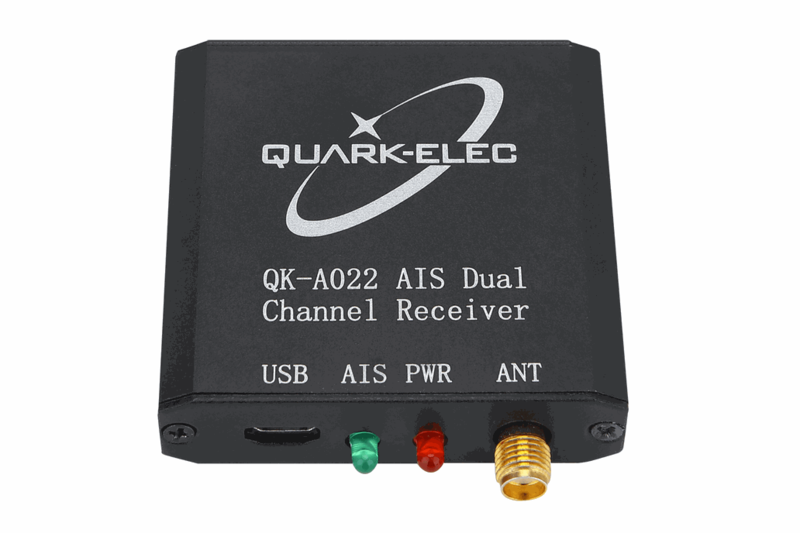 The QK-A022 is a dual channel AIS receive-only unit, designed to be installed in a protected indoor environment for the small commercial, leisure, fishing boat and vessel monitoring markets in order to listen to other vessel's AIS information. · This device does not come pre-loaded with map data. We advise using openCPN for map data. Some iOS apps may charge for map use. Driver can be download here. Application note can be download here. Note: This product has been well tested in the UK before dispatching to customer. Please make sure you understand how to use it before purchasing from us. For international shipping, VAT and other import or handling fees may be applied by your local customs. These are the responsibility of the recipient. We will always declare the purchase price excl. shipping. All technical questions please email to info@quark-elec.com. Alternatively, you can visit Quark-elec forum to find your answer. We have a 30 days refund policy. We will accept returns within 30 days, however, please be aware the buyer pays the return postage. If you do not accept these terms, we will not be able to refund the product. Bought this unit at my first attempt of receiving AIS broadcasts. I was on the lookout for a dedicated dual channel AIS receiver of good quality and reasonable cost. I was not disappointed. Excellent service and fast delivery. The unit works perfectly. My first VHF marine band antenna had a poor connection in it but when swapped with another one the receiver sprang to life. I'm about 3-4 miles inland in an easterly direction from the sea at an elevation of approx 30m. I'm receiving traffic around 15-20 miles to the south west, 10-12 miles to the west a bit less to the north west. of course being VHF the transmissions are line of sight and local terrain does affect me. I'd highly recommend this receiver. Great product, works fine, excellent experience! Great product, works fine, excellent experience, wee see important ships information and at moment works very well. Shipping with no delay and client support works great. Fantastic receiver. Almost as good as shipboard. I was so surprised at its size, especially for a dual channel receiver. The sensitivity and selectivity are excellent. Channel selection is automatic, no operator intervention required. In initial testing, clean decoding was normal at 25 miles with an indoor mini discone antenna with signals obstructed by a city. In addition, it is truly plug and play. Plug it in and NEMA sentences start pouring out. Pair it up with OpenCPN and you will have a great little ship tracking system that is super fun to play with. The performance of this receiver makes it worth at least 3 times the price.